Autumn is so beautiful, with its brilliantly colored leaves, the bright blue of the sky (when it isn’t raining), the crispness of the air, the crunch of fallen leaves underfoot. 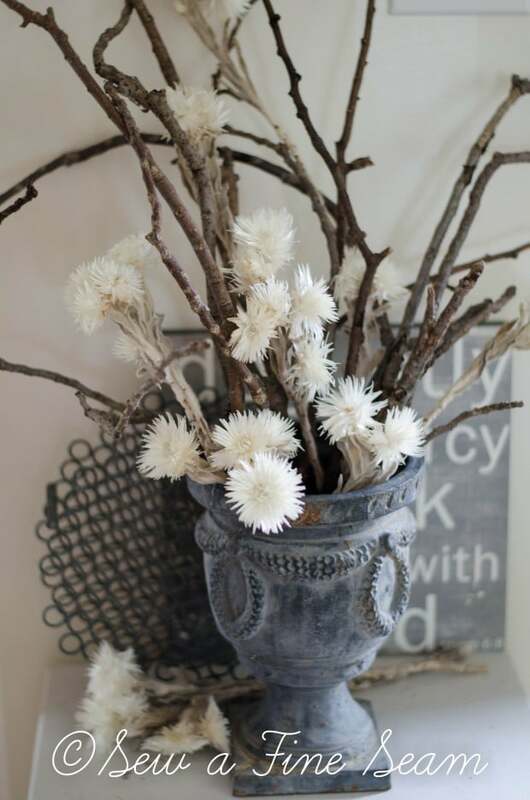 Bringing a bit of the outdoors in is a great way to to add quick easy fall decor to your home. 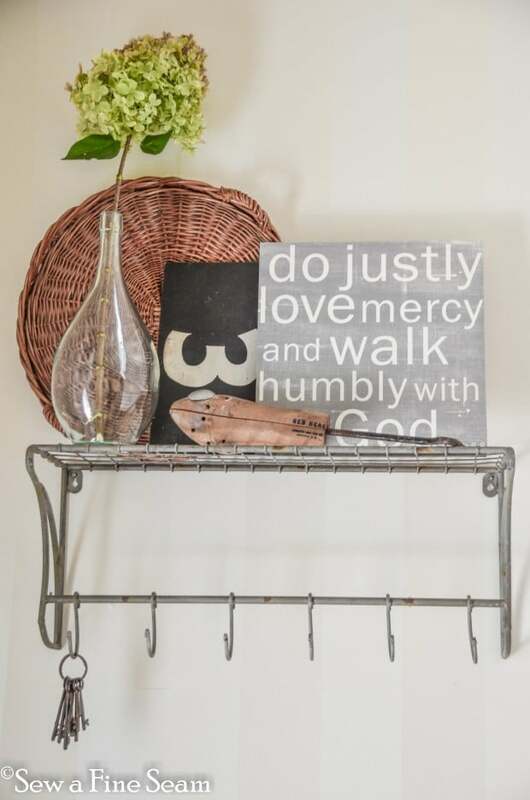 It doesn’t need to be a lot and it doesn’t need to take long, but it can freshen your space and bring smiles to the faces of your family and all who enter your home. This year I think I did less fall decor than ever. I’ve been busy with pillow orders and doing stuff for the store. My home decor has taken a bit of a back seat. But wait till Christmas! I can’t wait to pull out all the Christmas glitz and bling – I’ll be decking out the store as well as my home and I’ll share it all! 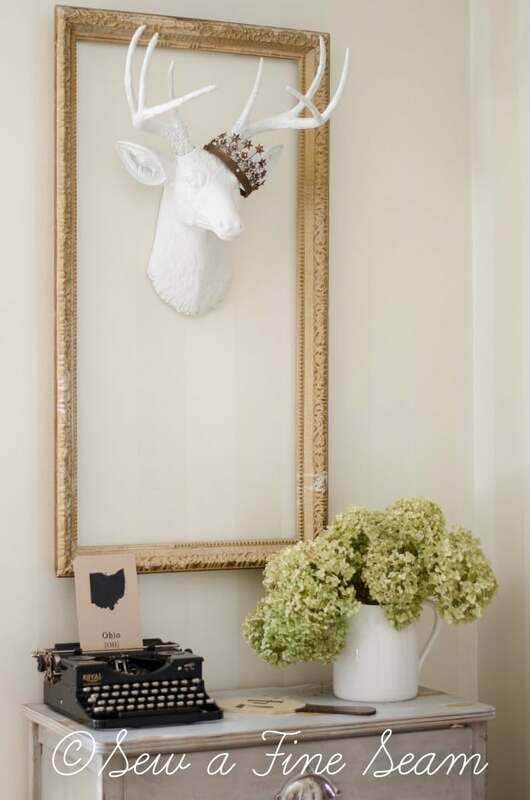 I’m rather fond of deer heads. 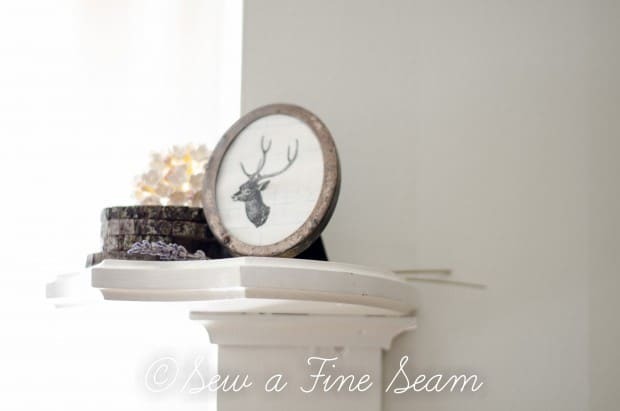 A deer head stamp on old ledger paper, cut to fit a vintage silver frame makes a great piece to tuck onto a small shelf or add some quirk to a large shelf display. 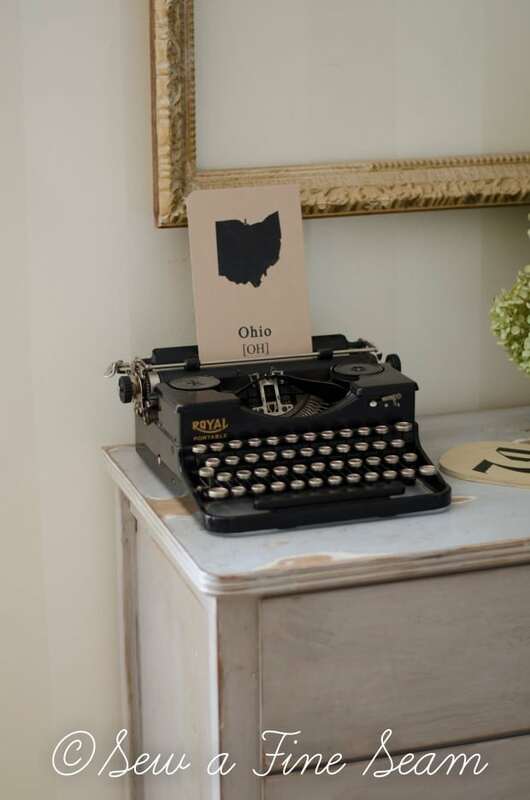 Old typewriters are such fun in decor. Add a bit of the season to make it fit whenever you want to use it. 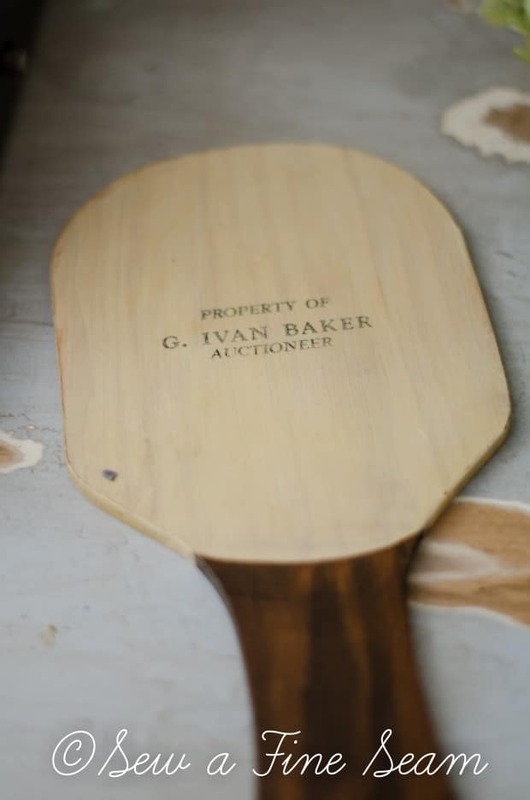 This old paddle was something I found this fall at the Springfield flea. Know what it was used for?? 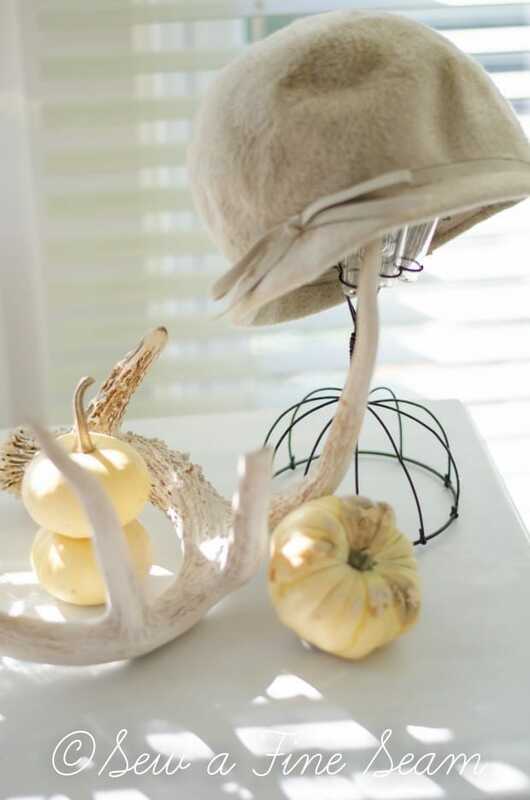 I use antlers year round in my decor but in the fall they become more front-and-center. More the main focus of the decor and less tucked back in a corner or off to the side. 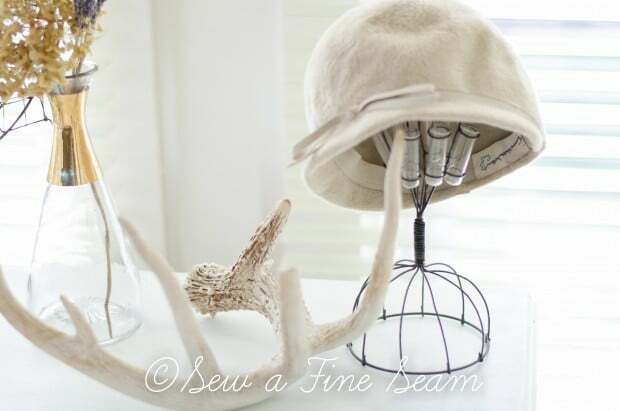 A fun hat adds some quirky fun to this display. Adding a few pumpkins here and there can be all you need to announce that the season has changed and Fall has arrived. I love the little white ones. Sticks are about my favorite. 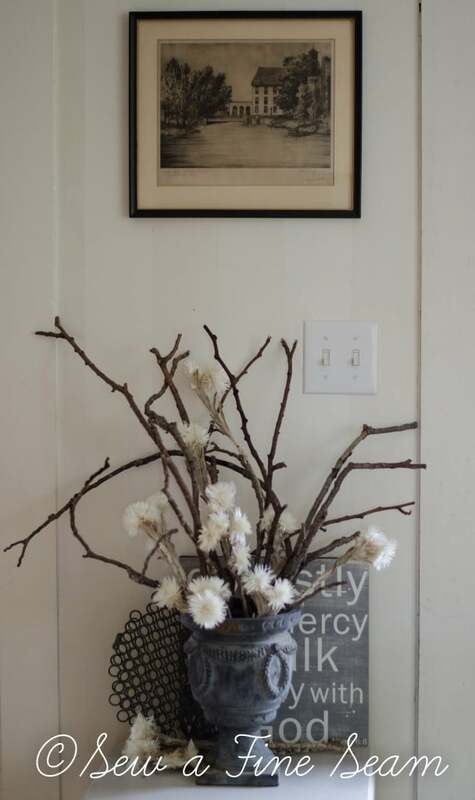 I’ve been hauling sticks inside for part of my decor for years now. 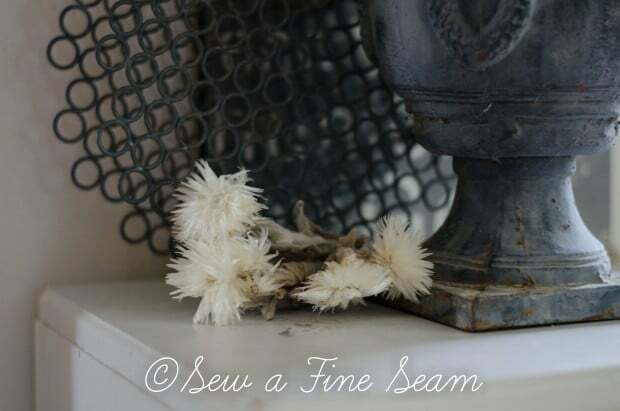 You can see some dried foilage and sticks in my post about my not-so-white-autumn-decor from a couple years ago. That year I also created a wall display with sticks and leaves and flowers and herbs. It was a lot of fun! Last year I made a huge arrangement of fall foilage from some purchased stuff and stuff from my yard. I like to bring the outside in but I also like to add some to my front porch. This year my front porch is in a bit of a transition as we sold the chairs we had and are hoping to get new ones for Christmas. You can see some outdoor decor from last year, and some outside decor from the year before last by clicking these links. 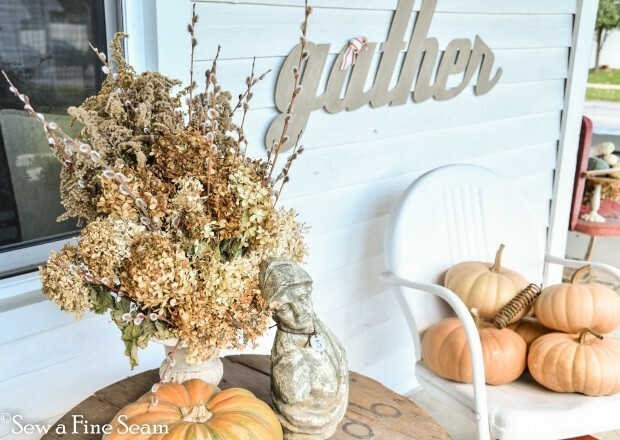 Here are a few favorite photos from last years Autumn Decor. My neighbor had some big sticks blow out of her trees. When she stacked them for the city guys to pick up, I bustled myself over and nabbed some of them. I still love this look and would do it all over again. I have a different couch now – slipcovered in white. The end table is gone now – Travis never liked it – thought it was too flimsy and looked like a sixth grader made it. I loved it and kind of miss it. The lamp has sold now too and I have a white IKEA lamp on the stand that replaced the end table. This was a fun display from last year too. I used sticks very liberally last year! 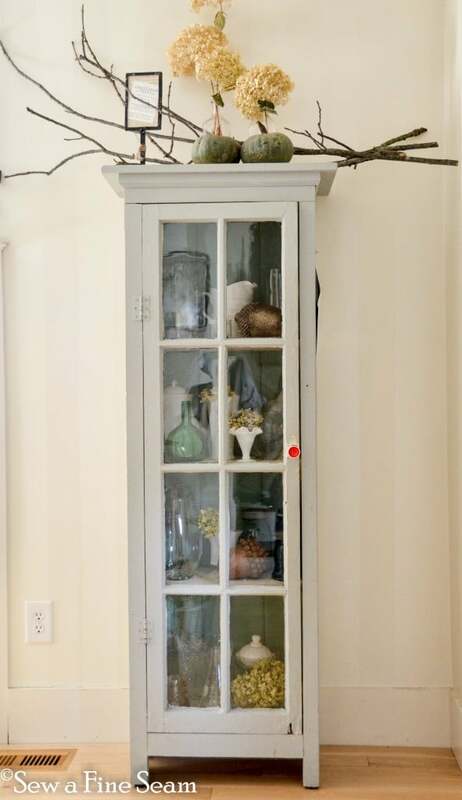 This year this nook is filled with painted pieces and paint jars that all need to be hauled to the shop. But looking back at these photos makes me want to clear things out and haul some sticks inside! My porch last year. The spool and chairs were all sold this year. I do have a couple chairs on the porch right now that I got a garage sale recently. They really go with our new garden shed that is nearing completion but they are hanging out on the porch till then. 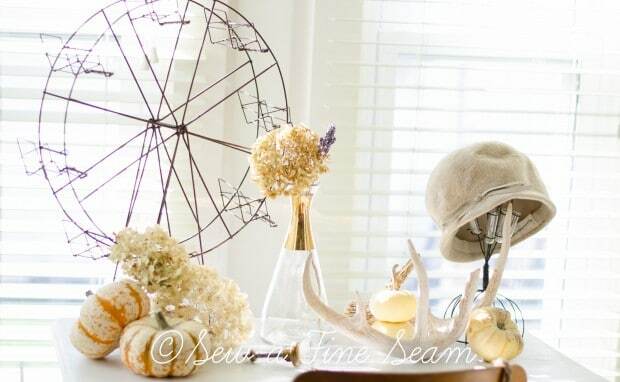 What kind of decor is your favorite for fall? 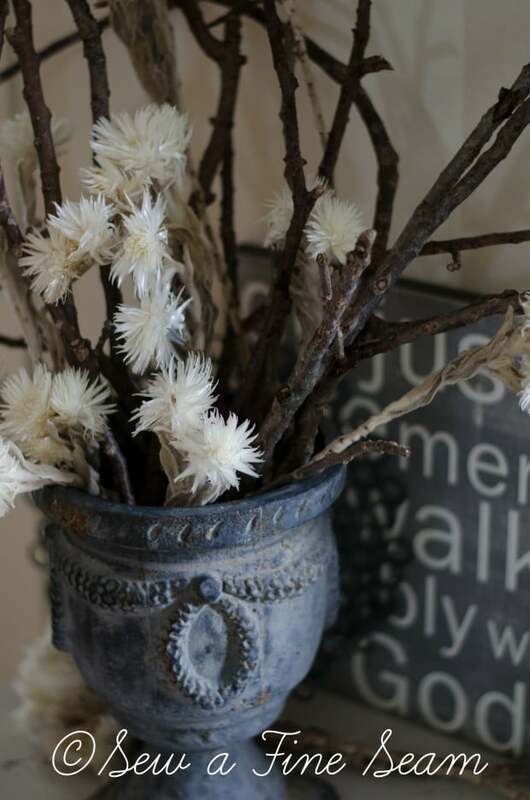 Do you decorate for each changing season? I just love your home and your decorating! So warm and welcoming!!! Thank yo so much Susan! I love that ferris wheel and totally understand why you had to have it. 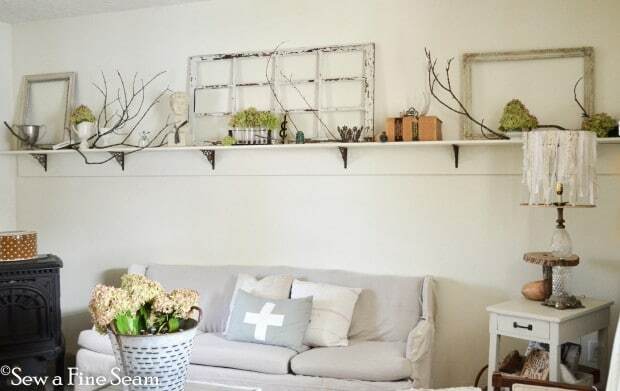 I’m alsoa envying your long living room shelf and searched your blog for other pictures of it. You say it’s 12-feet long. I’d love to do something similar in my living room. Any advice? Where did you get the brackets? And how far off the floor is it (to keep taller people from bumping their heads on it)? Thanks so much 🙂 The shelf is screwed directly to the wall – into the studs so I can put whatever I want on it and not worry about weight. The brackets aren’t really as functional as they look. They are covering the screws that hold the back board to the wall and they do help support the upper board. I think it is screwed to the wall too. I know I put some pretty heavy stuff up there sometimes! The brackets I got online somewhere and I don’t even remember where now. I looked for a long time trying to find five or six matching brackets that were bigger. I finally went with these and the longest side of them is actually fastened to the top board and not the back. If you would like to know what kind of wood we used I can ask my hubby. It was a large sheet of something that he cut into long pieces and there is a seam in the center. Not sure if you can see that in the pics or not. I should do some close-up photos of it and do a detailed tutorial on what we did. Thanks so much for the shelf details. If you get a chance could you find out from your husband what wood he used. And how wide is it and how many inches off the floor it is positioned. Thanks for your help. It’s very appreciated. 3/4 inch thick MDF (multi-density fiber) board. It comes in a large sheet and you cut it in the lengths you need. The shelf is 9.5 inches wide and the piece underneath against the wall is 7 inches wide. The long pieces were joined in the middle. My hubby used a stud finder to find the studs in the wall and the bottom board is screwed to the wall and then the brackets cover up those screws. The top piece rests on the bottom board and is screwed to the bottom board from the top. Then the brackets screw into both pieces and give support to the shelf. We really are considering getting a tutorial put together for this! Hi Jill I am loving all your displays so much. 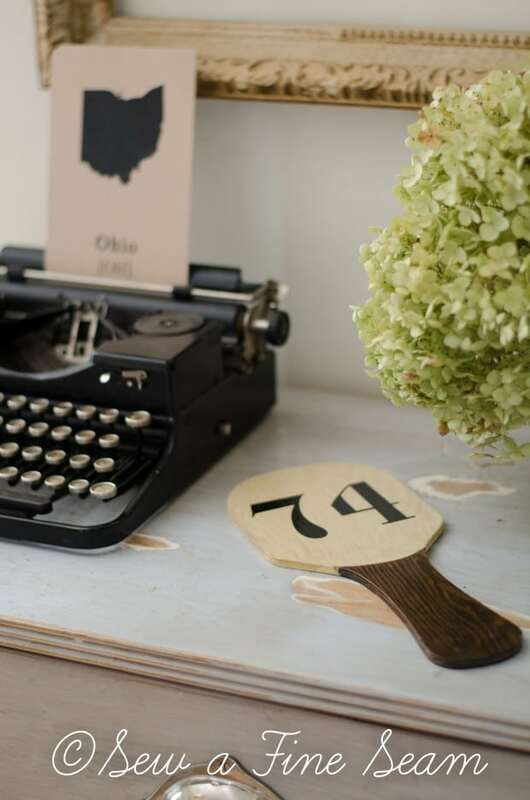 When ever I see photos of your home it always looks welcoming, homey and very tidy. How do you do it? I’d be so embarrassed if you saw my house now. I cleaned up living room today but there’s still stuff on the chair and in the hallway, EEEEKKKKK. I just can’t seem to keep things tidy for any length of time (if at all). 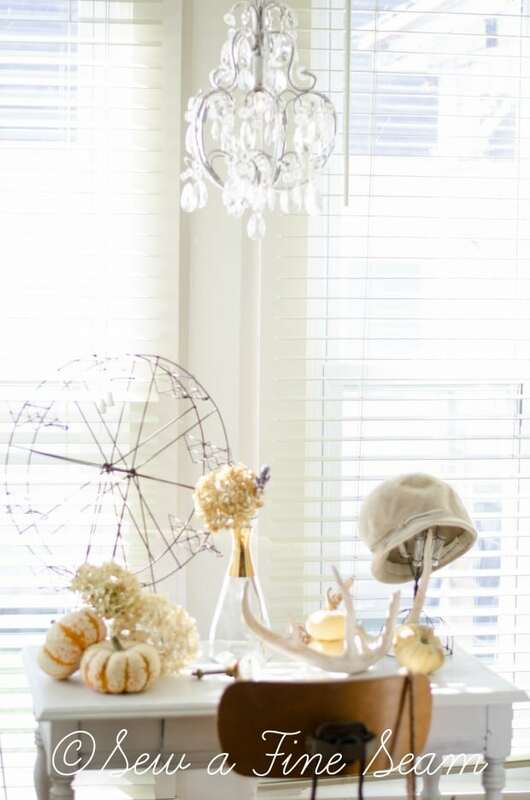 Your Fall decorations are very homey and so pretty with the light colors and the sticks, awesome. We don’t have any sticks but our neighbor has a trailer full of them from pruning his bushes, etc. Think I’ll have to go over to ask if he’ll let me have some. I’ll be looking forward to seeing your hoiday decorations soon. Before we know it those holidays will be here, they seem to sneak up on us. Hope you know how much I enjoy your blog and your friendship. Means a lot to me. Tonight we stopped at Family $ on way home for some snacks to tide us over til Wed. (payday hooray). We were up front with one lady whom was trying to decide on a Fall wreath. We started talking about things we make and she asked if I sew, she wants curtains made for a big window in their home. I told her how I made curtains with table cloths on sale among other materials. She is very interested in seeing our things we make, said she doesn’t mind paying little more for handmade local things. She was very interested in many things we make. She got our phone #, gave us hers, said she really wants to stay in touch, liked our attitude about how we do things. So keep your fingers crossed. She has a business also and hubs is going to take photos of his tools he’s been wanting to sell, she said to bring photos or tools by her business to show her workers. I hope she wasn’t just blowing smoke to talk but would be great if hubs could sell his tools and his big rollaway tool box he’s had for years. She was very interested when I told her about signs we make, furniture we make and table runners/pillow covers. She thought it was great that altho we’re older we stay busy making things. Told her how hubs would come home off road, cut out bunch of things for me even in winter in MT and then I’d sand and paint, etc. after he’d leave. She said we sure didn’t act like many people our age. I’ve been thinking of starting a blog but just not sure if I want to devote the time for it. I keep pretty busy as it is reading all blog posts I subscribe to. But I am thinking of it, what do you think about me starting one? I sure hope we’ll stay in touch. Better get myself busy, making some garlands, cut out burlap shapes then stenciled leaves, pumpkins, squirrels and owls. Luckily I had stencils and burlap. Have been having good time making them, keep coming up with more and more ideas of banners to make. Didn’t I say I’d better get busy. Chatty old lady, how do you stand it? Happy week. Hi, I was wondering where you got your craftsman style front door from? I am in love with it! 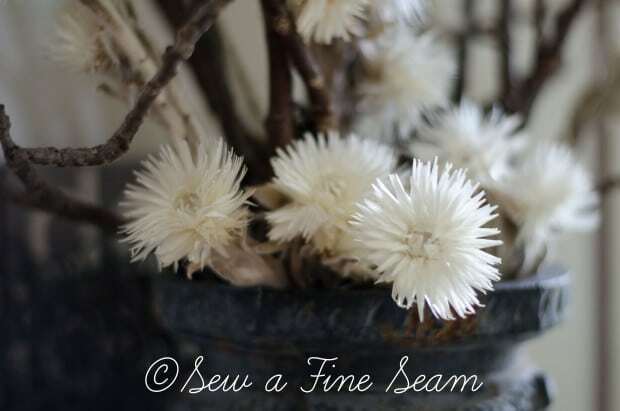 I saw it on a guest post you did last year for fall. Hi Whitney, that door is not mine it is my friends. I used her front porch for a photoshoot and that door was included in the shoot. I have no idea where they purchased the door but I can ask her. Yes please if u could, I NEED it for my house, I’m in love! 🙂 Thanks so much for your reply && help! Whitney, my friend said they ordered the door from Lowe’s!